Anonymous Press: AS THEY woke up! 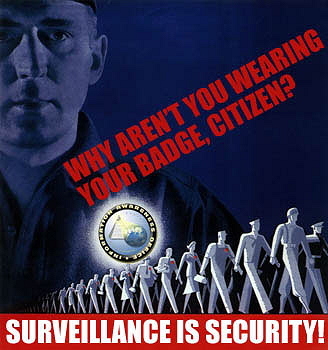 Control and monitor everyone and everything! AS THEY woke up! Control and monitor everyone and everything! As mentioned in a very recent article in pentapostagma. Gr school district in the San Antonio, USA, Project Tracking Student ( Student Locator Project (SLP)) is now mandatory and is in the final stages of implementation (test environment in beta) Jay High School in High School and Jones. But let's not think that this smart identity used only school district in San Antonio, Texas. In Austin, the Texas, the combined use of technology GPS (Global Positioning System) and RFID used to prevent students from lessons to avoid .. In fact, those students who have a poor track record at the school where courses are targeted to be under surveillance and monitoring .. Specific students are placed under the supervision of "mentors" who oversee the actions of students and where students are required to make weekly report! Already in London Big Brother has been alarming. The monitoring and recording sounds and conversations in public places (always under the pretext of preventing and combating crime) are used to bugs placed in public places so that even our conversations outside the home recorded, recorded and processed appropriately. It's creepy that by 2057 there will be about one million sensors and recording conversations for each inhabitant of London! Neurologists at the University of Berkeley in California used a technique that managed to watch the brain activity of people as they heard the words uttered these individuals. RFID chips used in mobile phones have the ability to detect a user's location with a sensitivity of only a few centimeters from the location (provided by GPS) through a new technology used in so-called "smart" phones (Smartphones). The Apple, Google and Microsoft monitor their customers for years, filing and storing personal data and making digital collaboration (mainly On USA) by the police and the Ministry of Security of the Country. The CIA has the ability to bypasses remote and gain access to every email, every phone call in, email the private conversation that takes place in the private space of the house people! It is important to have knowledge of practices to respond to the (very likely) and implementation efforts in Greece (the first example of the citizen card, card receipts, etc.) ..